Good news to those that love downloading a lot using the vigilante data plan, MTN Nigeria has increased their Pulse Night plan packages! I think this decision was made as a result of losing the data subscribers after the reduction of their Night Plan in August 2018. In a way to gain back their customers, the telecom giant, MTN has increased the data volume of their night plan. Currently, you can get 250MB for N25 or 500MB for N50 on MTN night plan bundle. There has also been another awesome adjustment, MTN Pulse Night Plan no longer stops at 3:30am but stops at 5am like others ISP provides. This means the data is expected to last between the time frame of 12am – 5am on subscription. Remember that only MTN Pulse users can subscribe to this plan. If you are not on the MTN Pulse tariff plan, you can migrate to the plan by dialing *406#. After the migration has been completed, send the following codes to purchase any night plan of your choice. Note: You must be on the MTN Pulse (Not the mPulse) to enjoy the plan. Migrate by dialing *406*1# or send 406 to 131. 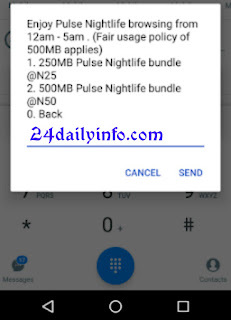 Comment on "MTN Increases mPulse Night Data Plan Volume - Get 250MB for N25 or 500MB for N50"